His book was a direct response to the writings of Sayyid Qutb, who some regard as the founder of militant Islam. Since then, Said has been spreading a vision of Islam free of violence and rooted in his exegesis of the Quran in a series of books that have been widely read and discussed by Islamic activists throughout the Arab world. Sheik Said believes that the mind can wield far greater power than does the sword. He is not the first one to hold such a belief. He is not even the first person to talk of nonviolence as an alternative to the use of force in the Middle East. But Jawdat Said’s approach is unique. Here, in Syria, he uses a mix of Quranic teachings, historical references and scientific discoveries to preach nonviolence … He emphasizes to the listener that this century is only a moment in time, and that the roots of nonviolence formed at time’s beginning. Since then, the dogma of nonviolence has been preserved and used through history. Said has not only thought about nonviolence, he has practiced it in the midst of dictatorship, and has been jailed many times for his efforts. Though some commentators still believe in the potential for a nonviolent pro-democracy movement to succeed in Syria (see here, here, and here), a growing number of people take a dim view of the effectiveness of the nonviolent struggle at this stage of the conflict, as the government’s violent attacks increase daily and as the Free Syrian Army grows. How then are we to interpret Said’s resolve? Is it only a perilous gesture? Or can it help open a new avenue for a just peace? And, if so, can it more broadly illuminate the power and dynamics of nonviolence not only in Syria but elsewhere? There are no guarantees with nonviolence, just as there are no guarantees with violence. But a growing body of data suggests that nonviolent action can play an important role in creating the conditions for change. Is this possible, though, in situations of extreme violence? 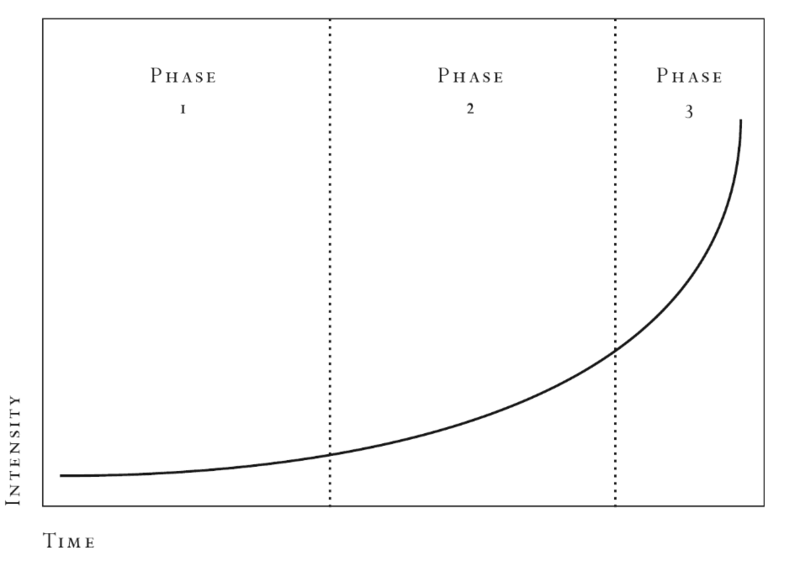 I have found it useful to think of the way violence feeds itself, the escalation of conflict, as a steep curve (see graph) where time is plotted against intensity — intensity measured not by the number of weapons but the degree of dehumanization, the single most telling parameter of hostility. The important thing to bear in mind is that nonviolence, like violence, also comes in degrees. In both cases time turns up a rheostat and progressively more energy, violent or nonviolent, is activated. Therefore, when a conflict has been allowed to go on and on before you finally intervene, the degree of nonviolence you need has to “escalate” accordingly. The longer you wait, the more soul-force you need to apply. Nagler proposes that conflicts escalate in three phases. In the first stage, many conflicts can be dealt with through the methods of conflict resolution. If they worsen, though, a different level of response is required. Stage two — in which the anger increases, positions harden and hearing shuts down — necessitates what Gandhi called satyagraha or soul-force, which has the potential to reawaken the parties (including the population or even the international community) to options that have seemed closed off. Finally, stage three is a realm of extreme violence that demands a level of soul-force in which the humanity of the nonviolent advocate is, in Gandhi’s phrase, “mathematically proportionate” to the inhumanity of the opponent. One example of extreme nonviolence that Nagler offers is the protest that took place in Nazi Germany in 1943 by non-Jewish wives of Jewish men who had been arrested for deportation to death camps. The protest escalated, at great risk to the hundreds of women who refused to budge (even as they were continually being threatened by the Gestapo) until the men were released. It would be impudent to read too much into Sheik Jawdat Said’s impending return to Syria. Without a much sharper understanding of the realities, the history and the crosscurrents on the ground, it is best to leave any assessment of his intentions in the hands of others, probably others far in the future. Having said this, Nagler’s schematic may nonetheless underscore the gravity — and potential — of Said’s willingness to appear in the midst of escalating violence and to articulate and enact, as he has been doing for decades, the third way between violence and passivity. Whatever comes of this, though, there is much for us to learn here — about principles, about courage, about hope and about a belief that violence does not have the final word. Sheik Jawdat Said is following the logic of a lifelong journey, something that prompts both awe and soul-searching far beyond Syria. Wonderful, Ken. I also wrote something about Syria that I’m sending to Yes! Meeting Jawdat was something else! The third way of “escalating nonviolence” what an incredible concept. How often have we heard that revolutionary change can only be brought about through violence? How long can we ignore a human history that has been inundated with violence for thousands of years, and yet nothing has changed – we still live in world dominated by a patriarchal hierarchy that relies on violence to maintain this status quo. It is also a liberating education to learn about the Islamic tradition of non-violence. The Western and particularly U.S. main stream media has longed painted Islamic society as inherently violent while ignoring America’s own long history of extreme violence including the genocide of North America’s indigenous population. 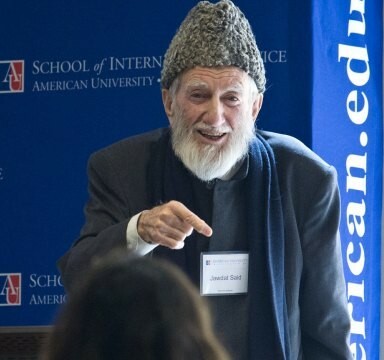 Thanks for such a nice article,also see another muslim non-violent solder Bacha Khan who organize 100 thousand army in the present violent place of the work,Khyber Pukhtoon-khawa provience of Pakistan.He spend 33 years of his life in prision,work non-violently for independence.we should bring all such non-violent Muslim Preachers teaching together since violence is mostly in the Muslim world nowa days. Thank you for this article. I believe that the time is ripe now for Said to come back to the scene. More and more people in our region are realizing how absurd violence can be. But I think Said and other nonviolent activists in Syria have to come up with a clear operation strategy. Hallo, we are part of italian peace movement, il liaison with Mussalaha peace mission driven in may 2013 by Mairead Maguire nobel laureate. Have you got actual news about Scheik Jawdat Said’s nonviolent activity concerning Syria ?